Best tidal range – Lower tides work best for beginners, be careful as the tide fills in the water gets deep very fast and there can be quite a sweep generated by the current. 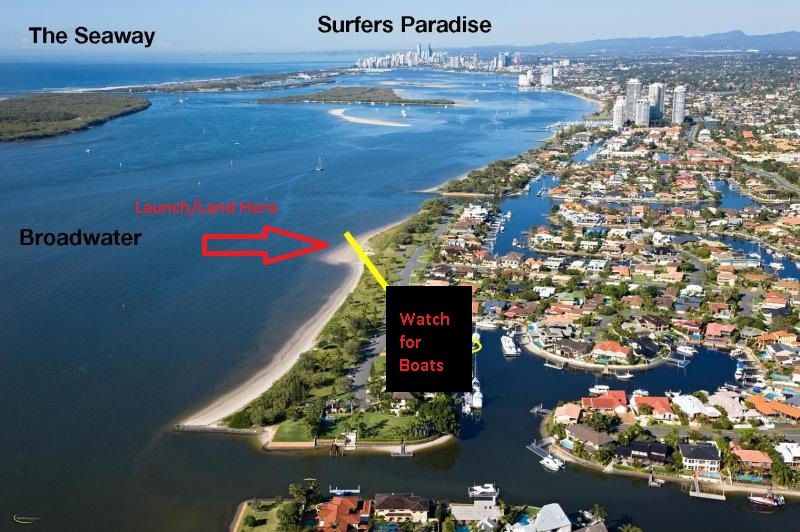 This is one of the less busy flat water spots on the Gold Coast. Good for beginners on Low tide. Can get choppy depending on the tides, works best on dead high or dead low tides as current generated by tide can be quite strong and sometimes work against the rider. You can ride over the Broadwater to reach South Stradbroke Island, or run a down-winder to or from SeaWorld. – On high tides, basically anything over than 1.5m, it can get very deep very quick! – Watch out for boats, as this is a heavily used boating channel. If you are not confident rider stay close to shore and do not ride within the channel. – Especially when there is a large tidal cycle on, the tide comes in/goes out incredibly fast. Make sure you don’t leave your pump, etc lying on the sand unless you know how the tide works there. – Stingrays are also occasionally around the shallow sand flats. They will only sting you if you step directly on to them. So, if you are doing a lot of walking in shallow water while kiting, then do the stingray shuffle – keeping the feet close to the bottom, rather than stomping around. Also making a bit of a commotion in the water before touching the bottom is a good idea – the ray will sense the vibrations and swim away before your foot lands on it.